COMPAC-WINE new generation corks are the result of the application of technologic processes to cork. The range guarantees absolute sensory neutrality as well as the reduction of TCA, Guaiacol, Geosmin and other molecules. CWINE corks are the ideal stoppers for adding the perfect finish to the wine-making process that takes place in the winery. Their excellent quality ensures that the work in the vineyard and the thoughtful care of the wine-maker reach the final consumer in the very best possible condition. CWINE preserves an excellent sensory neutrality once in the bottle, but also offers coherence and homogeneity to each batch, bottle after bottle, year after year. The organoleptic neutrality is the result of the application of our TD3 and Montebello extractive technologies which reduce TCA in cork to undetectable levels without altering the cork structure. TCA (2, 4, 6-Trichloroanisole) manifests itself in wine by means of a disturbing aroma characterized by the scent of humidity, mould and cork. This molecule is what is responsible for “corked wine”. TCA molecules are synthesized from chlorophenols by the action of mould in contact with chlorine. Chlorine may be present in the bark of the tree, polluted by pesticides, or in the air. Moreover, some fungicide products used for treating wood (carpentry, pallets, etc.) or for preventing fire (wood, interior of electric cabinets) can transform molecules responsible for the “cork taste” into TCA. This transformation may occur when treated wood comes into contact with natural moulds present in the wine cellar. The boiling point at atmospheric pressure of TCA is high (240°C) although at the same time, TCA is a volatile substance even when in solid state. This volatility is what allows it to be extracted under vacuum conditions. Its perception threshold in wine is very low: 1.5 – 3.0 ng/L. Other molecules can also cause sensory deviations: octen-3-one gives a fungal aroma; and 2-methylisoborneol gives a mouldy aroma which makes the geosmin that may be synthesised by a kind of Penicillium disappear in the course of the alcoholic fermentation. Its chemical degradation is very slow (two months at 20°C to reduce its content by 50%, 24 hours at 70°C to reduce its content by 85%). - System based on the volatilization of molecules. - Reduction of releasable TCA and other molecules to <0.3 ng/L per cork stopper. - Density and moisture controls before and after the processing. - Reduction of releasable TCA to 80-85% per batch. Technology based on volatilization, an advanced physical technological process. A flexible process which controls the destabilization of the phenolic molecules found in the granulated cork. 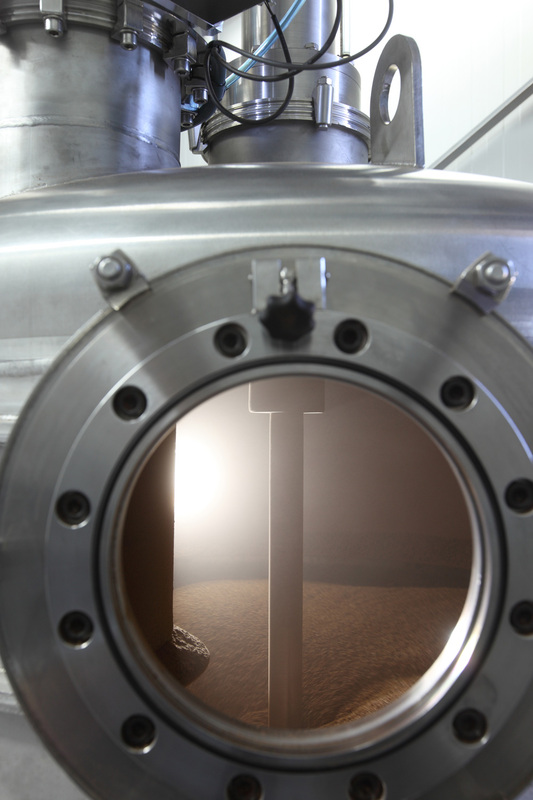 The control of pressure, temperature and application time allow the molecule extraction to be calibrated. The molecule extraction depends on the chemical weight of each substance. Molecules with the lowest boiling point are the first ones to disappear. Progressively, as the temperature rises, molecules with a higher boiling point start volatizing. TCA, which in a gas atmosphere is forced to abandon the cork structure, is found in this last group. Latest generation technology for extracting organic (TCA, TeCA, TBA and PCA) and volatile compounds. This technology enables us to achieve unquantifiable levels of extractable TCA. Sustainable, innocuous technology from the environmental point of view with low energy consumption. Four 1,000-litre extractors of individual capacity. 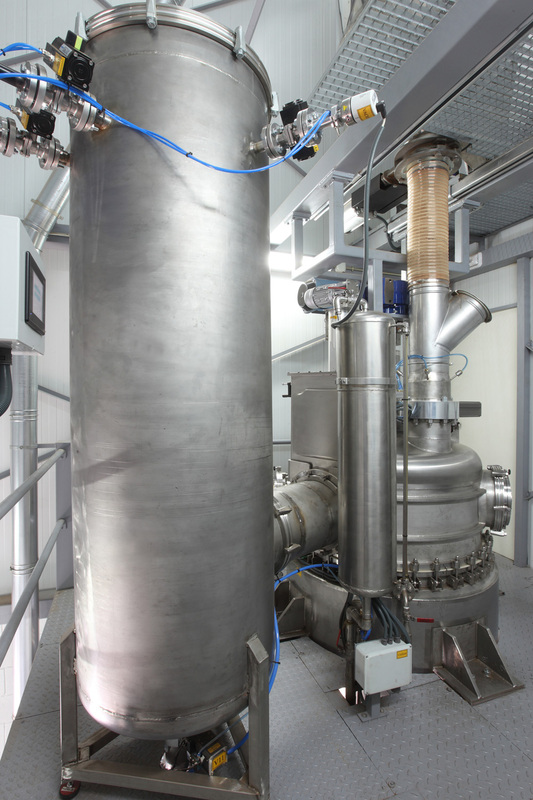 Three 500-litre separators that allow the extractions to be fractioned. Pressure pumping system of up to 350 bars with injection of cosolvent. Equipment for preparing the raw materials for optimum processing conditions. Heating system for temperatures of up to 100°C with two connected thermal circuits to achieve maximum energy use. Cleanroom for packaging the final product with the option of packaging in an inert atmosphere for instable products. A curing technology developed by the Trefinos Research and Development team, 100% integrated into the production process and conceived for extracting TCA and other volatile compounds, based on the combination of a physical process of pressure and temperature applied to the cellular structure of the cork and creating ideal conditions for separating the TCA from its cellular structure. The MONTEBELLO process is based on not adding chemical supports to guarantee that the cellular structure of the cork will not be altered, in other words, neither its elastic properties nor its permeability. Micro agglomerate stopper for still wine, produced by individual moulding with 0.5-2 mm cork particles. The range offers 3 oxygen permeability levels.